Many people who are marrying for the first or second time want a prenuptual agreement to be sure they have a shared and clear financial plan with their new spouse. Either or both may want to protect children from a prior relationship. 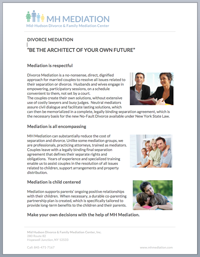 By working with a mediator, you can jointly and peacefully think through what needs to be in your agreement. A prenuptual or postnuptual agreement can also be used to plan your will and estate so that all of the people you love are protected after your marriage in the event of your death. Make a joint consultation appointment, and we can figure out what would best serve your marriage together.